Coleraine have completed the signing of striker Jordan Allan from Derry City. The former Dundee United front man joins the Bannsiders on loan from the Candystripes until January. “Jordan gives us another option up top and provides a bit more competition for places,” said boss Oran Kearney. “He’s strong, he holds the ball and can go in behind defences and runs the channels well. Allan started off in Dundee United’s academy, going out on loan to Albion Rovers during the 2013-14 season, before joining Scottish League One team Morton in July 2014. He made eight appearances for the club during the 2014-15 season for the club before moving to League Two side Montrose in January 2015. He went on to play a part in six league, including one match in the play-offs, as Montrose survived dropping out of the league by beating Highland Football League side Brora Rangers. 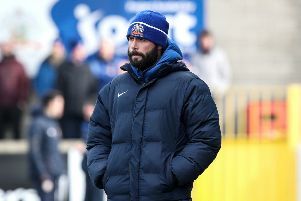 Jordan left Montrose after the season’s end in July 2015. In December 2015, Jordan signed for Kenny Shiels at the Brandywell. Allan will wear the number 23 shirt.